When writing blog posts, I like to be guided by topics that I am either frequently asked about, or conditions that I seem to be seeing more of at a particular time. Calf pain and strains appear to be topic of the moment right now. So, today, I’ve put together some information on common forms of calf injuries, their causes, common symptoms and recommended treatments. How do calf strains happen? For runners, they are frustratingly common and in the ir many forms, are often sudden in onset and initially stop you instantly in your tracks. Having suffered a gastroc strain myself last year, I can whole-hearted sympathise with you if you are reading this for advice on how to help yourself, so I hope you find this useful. 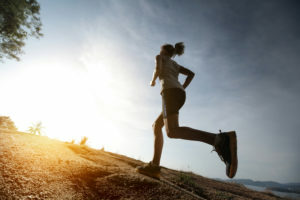 In the fitness industry calf tears often occur in typical training activities such as shuttle runs (requiring rapid acceleration and change of direction), split jumps (where one leg is thrust backwards on landing), incline running and sprinting. Similarly, injuries to the calf and/or achilles are extremely common in boxing sessions where participants are jumping and hopping on their toes. They also occur regularly during running on uneven surfaces or during hill training. This is where the explosive extension of the knee is combined with dorsi-flexion at the ankle when running intensely uphill, suddenly over stretches at the gastrocnemius musculotendinous junction. Depending on their severity, you may feel a little sore but able to walk with a slight limp for a few days but return to activity within 1-4 weeks. Or, you may be able to weight bear but not without the aid of crutches. Or in severe circumstances, you may be completely incapable of weight bearing, and need the help of crutches to get around for a 2-3 weeks, with a very gradual return to mobility. In more severe cases, where there is a full rupture of the gastroc, soleus or even the Achilles tendon, a much longer and very specific rehabilitation programme should be followed and closely guided by a professional therapist. The good news is, that following the careful rehab plan outlined here, and most importantly, looking after the injured site in the very early stages after injury with the PRICE protocol (protection, rest, ice and elevation for the initial 24-48hrs), will put you on the front foot back to recovery. Of course every individual responds to rehab differently, and so I would urge you to seek advice from a Sports Therapist or Physiotherapist who will fully assess your injury, and help guide you back to fitness. Examine the appearance of your Achilles tendon and how it moves as they squeeze your muscle. It is important to rule out tearing of the Achilles tendon, which can appear very similar to a calf strain in the initial stages. Ask you to contract your muscle and move your knee and ankle joints in order to determine how much range of motion you have and whether or not moving your foot causes calf pain. Further tests will be performed actively, passively and resisted, in order to help determine the location, severity and nature of the strain. It is likely that these tests will be performed in any subsequent treatment sessions to assess the stage of rehab and determine the how best to progress exercises. So to help you have a clearer picture of what structures the therapist will be assessing, lets look at the calf and what it is made up of. WHAT MUSCLES MAKE UP THE CALF? 3) the PLANTARIS muscle and tendon (not shown) is long and thin, and joins the soleus and gastrocnemius muscles to insert onto the calcaneus (or heel bone) via a common tendon – the Achilles tendon. Due to the large gastrocnemius muscle crossing over both the knee and the ankle, it functions to bend the knee and point the foot/raise the heel. These two key movements of everyday life allow the foot to push off during walking and running and also with the assistance of the soleus, to provide balance and stability when landing from a jump. The soleus is responsible for the same movement (i.e. raising the heel or plantar flexion), but when the knee is bent. PAIN IN THE CALF – HOW IS THE CALF INJURED? Causes of calf pain can include muscle cramp, delayed onset muscle soreness (DOMS) and referred pain from the lumbar spine. However, by far the most common cause of pain in the lower leg, is a strain to the musculotendinous complex of the gastrocnemius and/or soleus. Group exercise classes such as step classes (usually on stepping down and pushing the rear leg down to the floor and then pushing off to complete the next step) as well as during high impact classes. These injuries often occur towards the end of the class due to muscle fatigue or a loss of technique. Simply being unlucky performing every day activities however, can cause this type of injury, such as falling off a curb, climbing stairs or suddenly running for a bus. Poor footwear choices; not only inappropriate trainers for running in but something that I see more and more regularly, is the damage caused by the regular wearing of high heels. Over time, with consistent daily wearing of high heels, the gastrocnemius and soleus become shortened and weakened. As and when the foot is placed in flat shoes and asked to function dynamically, it is biomechanically compromised and prone to injury. Even a gentle calf stretch can become painful with prolonged wearing of high heels, so give yourself a break every now and then to avoid this becoming a problem. SO, take heed ladies (and gentlemen), don’t fall victim to those “killer heels”! These injuries are all sustained when the the gastrocnemius muscle is forcibly lengthened and overstretched suddenly against its own contraction. Most frequently, but not always, this strains the medial head (the inside) of the gastroc, and half way down the calf, where the muscle fibres of gastrocnemius meet the Achilles tendon and fail to withstand the tension created by the movement. N.B. Differentiating strains in the gastrocnemius, soleus, plantaris and Achilles tendon is particularly important for an accurate prognosis, appropriate treatment, and successful prevention of recurrent injury. It is important to get an assessment of the exact nature and severity of the calf pain being experienced, so that the correct treatment can be offered. 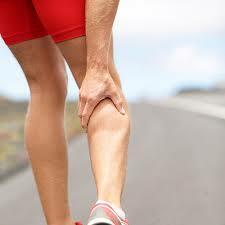 While the initial stages of treatment of all grades of these injuries is very much the same for the Acute phase (the first 24-to 48hrs), care should be taken when deciding on the pace and progression of rehabilitation, in order to prevent secondary inflammation, and/or further tissue damage by progressing too quickly. some advice on how best to treat them. Of course all individuals are different and respond in varying ways to rehab, and so guidance through a qualified physical therapist is always advised when embarking on any rehab programme.